“Is this the road?” I enquired pointing at the map. The security guard looked at me blankly and said “30 yuan, taxi.” I replied, “No yuan, no taxi, is this the road?” A bit confused, he rushed towards the glass building and spoke to a woman. She had just stepped out of the office. I looked around; the office block, the motorway, and the subway station, nothing looked familiar. I had been walking for an hour on the dusty streets. Undoubtedly, I was on the Airport Express Road. Earlier in the day, we had driven through the smoggy city and had taken the rope-way to the Great Wall of China. The little market on the wall, selling Chairman Mao T-shirts and various curios, was a display of Chinese entrepreneurship. Following that was our endless drive to the Forbidden City, which was like an expansive onion with layers of palaces and courtyards. 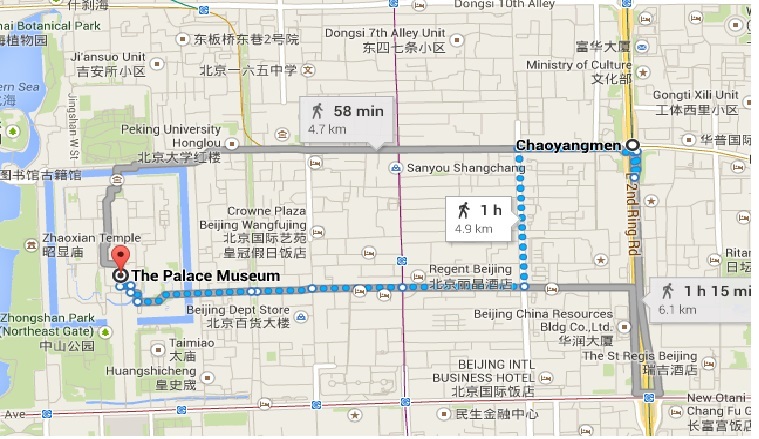 Our Pick up from the Forbidden City was around 4:00 p.m. By that time we had lost our bearings hence we missed our shuttle. Stranded in a foreign city is a daunting feeling but then we were a group of eight. Unable to find a taxi, we asked for directions. Each person we probed nodded their head, gesticulated and pointed east – the hotel was not far away. As we walked on Donghuamen street, I spent all my money on a spider. (Read the story here- https://biswadarshan.com/2014/09/01/lost-in-beijing-part-1-spiderman-2/ ) A bit later, I was separated from my colleagues. The middle-aged office woman dressed in a blue-pastel shirt and formal trousers came up to me and started speaking in Mandarin. 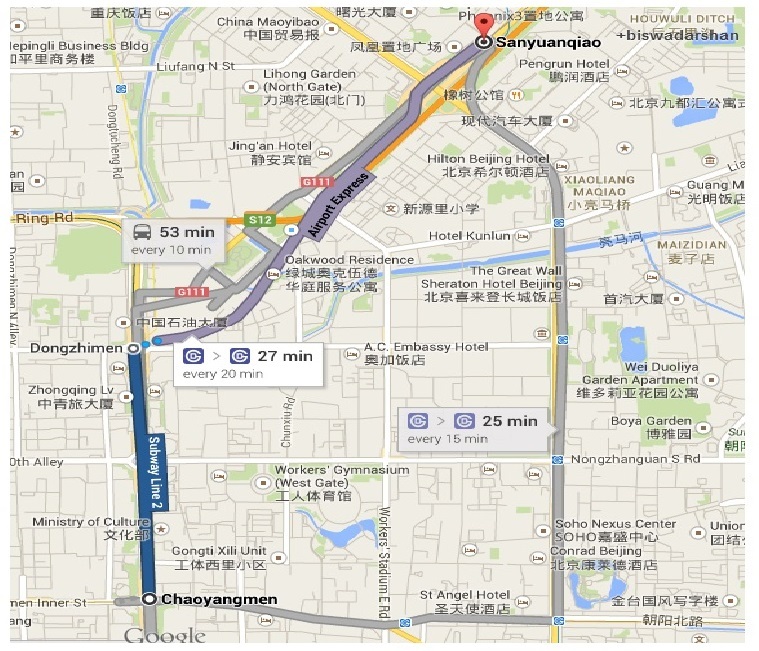 I pointed at the map for validation of direction, I was heading for Chaoyang District. She said that I was on some Ring Road. “It take you more than two hours, come.” Adjusting her black rimmed glasses, she pointed at the subway station. She insisted repeatedly. Without batting an eye,she said, “I’ll buy you ticket”. She lightly held my right elbow and guided me towards the subway station. We took the subway from Chaoyangmen to Dongzhimen and from there I had to change to the Airport Express Train to go to Sanyuanqiao Station, which was near my hotel. “Yes”, I nodded my head in pleasant disbelief. She queried what I was doing in Beijing. I told her that I was a flight attendant. She could not understand me, so I said I worked as cabin crew. She smiled, I was incomprehensible. She placed 30 yuan in my hand and using all possible sign language and broken English, “you get out… and buy ticket, go expressway”. So saying she bought me my first ticket and explained with her fingers “Your stop – one,two ”. I was back in kindergarten. At Dongzhimen station, she alighted the train along with me. She pointed towards the exit and repeated my counting lesson. I thanked her and requested her to board the train – I did not want her to miss it. I got teary eyed as I thanked her and waved my hand. I realised, I had not even asked her name. As her train left the station, I felt surreal. Surely,she was an angel… and she was made in China! This entry was posted in Travel and tagged #cityofangels, #greatwallofchina, Airport, Angel, Beijing, City of Angels, Great Wall of China, subway. Bookmark the permalink. 4sure angels do exist around the world!.Great memory!! Human kindness is a international phenomenon and can be so reassuring in an alien country. I was glad that you wrote about two such incidents in two consecutive posts. Slopes of the Centre of the Universe! Kathmandu, Realm of the Goddess! Patan, Abode of the Divine! I like to move it move it !